Praised by the New Jersey Star Ledger as a “talented artist of great promise” violinist Ashley Vandiver has earned recognition as an artist of the highest level. Winner of the Canepa Award, and the Yellow Rose of Texas Governor's Award for Musical Achievement, Ms. Vandiver has performed in over thirty countries on five continents, including solo performances at the Midwest Clinic in Chicago, Boston’s Jordan Hall, and the International Bach Festival in Leipzig, Germany. 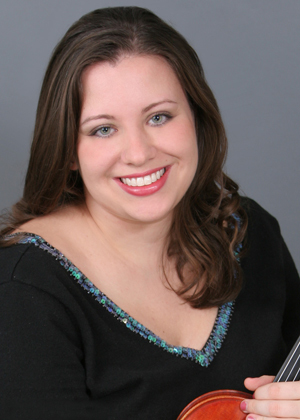 While her heart still considers Boston her home, Ms. Vandiver spends much of her time in Toronto with her husband, cellist and arranger Alastair Eng. It’s not unusual for her to have A Far Cry rehearsal in the morning in Boston, and an evening performance in Toronto with the Canadian Opera Company or the Esprit Orchestra. An avid chamber musician, she has appeared onstage with such renowned ensembles as the Borromeo and Hausmann String Quartets. Other chamber music credits include appearances with Roger Tapping, Norman Fischer, and Nathaniel Rosen. Ms. Vandiver’s love of the symphony orchestra led her to serve as Principal Second Violin of the UBS Verbier Orchestra under the direction of Maestro James Levine. She has also held positions with The Resident Orchestra of The Hague, The Schleswig Holstein Festival Orchestra, and The Boston Philharmonic and performed with the Florida Symphony and Miami Pops Orchestra. A devoted teacher and educator, she has been a member of the violin faculty at Wellesley College, as well as Project STEP, a program for extremely talented Black and Latino students. While at STEP, Ms. Vandiver founded the solfege program, an innovative course, which is now part of the standard curriculum for all STEP students. She has served as a guest clinician in schools and youth symphonies all over the United States and has maintained a private studio for more than 15 years. A graduate of the New England Conservatory of Music with Distinction in violin performance, she then went on to receive her Master of Music Degree from the Royal Conservatory in the Netherlands. Her Principal teachers include Vera Beths, James Buswell, Kennith Goldsmith and Laura Bossert. She performs regularly on a violin by Jonathan Cooper from 2004. She is an active member of the Human Rights Campaign and the MSPCA. She is also a serious Red Sox fan and bought seasons tickets to the Blue Jays in Toronto, simply because she could see her Sox play nine times, for little more than a dollar a game. Best deal in Major League Baseball. She is a fan of all the pro sports teams in the Boston area, as well as the Texas Longhorns, and the Kentucky Wildcats.